Updated Monday February 25, 2019 by .. Welcome to the Red Hook Sea Raiders! 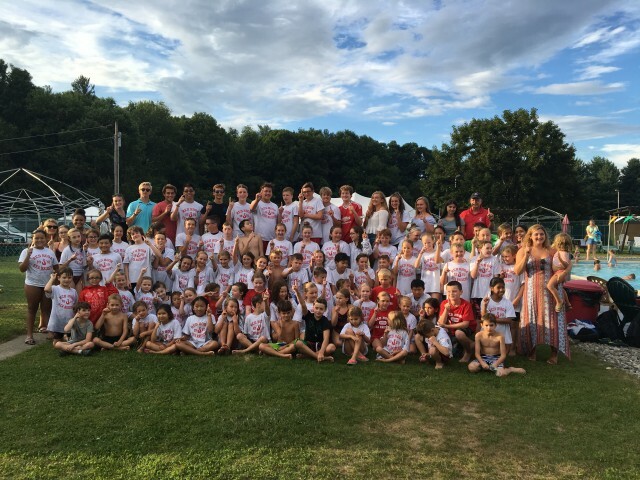 The Red Hook Sea Raiders Swim Team is a competitive swim team for youth ages 6 to 18. Pre-team is also available for children ages 5-7. Pre-team swimmers need to be comfortable enough to jump in the water unassisted and swim a short distance without flotation devices. The swim season is approximately 6 weeks in length and is a great opportunity for kids to build swim skills while having fun! Our team is one of eight teams in the DUSO League (Dutchess and Ulster Swim Organization... http://www.DUSO.org). It is also a fun family sport - we need YOUR involvement as well! This year’s registration is on line. Go to the registration tab on the www.redhookpool.org home page. Practice begins Wed June 12 from 4-5:15pm, continues daily Mon through Fri from 4-5:15pm until school ends. Starting Thurs June 27 daily weekday practice will move to 7:30 a.m.- 9:15 a.m. A calendar of the season will be available on www.redhookpool.org under downloadable forms. We will not have swim suit try ons this year. We encourage all team swimmers to purchase the team suit. It is available in youth/adult sizes online at http://www.swimoutlet.com/redhooksearaiders Other useful swim gear, such as goggles etc., can also be purchased at the same time should you require it. Please order your suits early to ensure you can get the size you require. Click on Team Suits tab to make sure you are purchasing the correct suit. Girls suits are between $20-$25, boys between $12-$20 depended on the size. You get free shipping for orders over $49, so order with a friend! To begin registration please click the registration tab on the pool’s home page. For more information please contact: Michelle Hally 845.802.6319, or email: rhsearaiders@gmail.com . Listed are swim team survival guidelines for parents and swim team members!! Check www.duso.org for further information about directions to away meets. Please join our Remind link for updates and swim team cancellations due to weather on your phone. This is a free, quick and easy way for us to get important text messages to everyone. Enter the number 81010 and text @searaider. Wed. night warm ups start at 4:00 p.m., the meets begin at 5:00 pm. Saturday warm ups start at 8:00 am, the meets begin at 9:00 am. 1. Our swim meets run completely on a volunteer basis. Each meet require between 40-50 volunteers. Therefore, it is necessary that each family “volunteers” their time at all meets. Please check Sign Up Genius through your email for job assignments and sign ups. 2. At our home meets, the swim team provides a snack bar. The snack bar runs completely on donations from each swim team family. As part of your registration, a $30 buy out will be added to cover the costs of baked goods/snacks/fruit/beverages we purchase to sell at the meets. In the past we have had families bring food to sell, but we were finding that more and more families opt for the buy out, so we are now requesting everyone participate in that way so we can eliminate the amount of work necessary to coordinate that. This year we have three home meets to buy for. 3. Team Swim Suit. Available in youth and adult sizes online at http://www.swimoutlet.com/redhooksearaiders Please order early (before May) to ensure the size you need is in stock. 4. Swim clinics will be available throughout the season for swimmers in Lanes 3-6 who would like additional stroke instruction. These clinics have limited space and are not a substitute for morning practice but are beneficial, especially to the newer swimmers. Clinics will run Tuesdays and Thursdays, starting July 2nd . Lane 3-4 are from 7:00-7:45pm and Lanes 5-6 are from 7:45 – 8:30pm. 5. Our coaching staff would appreciate everyone in attendance at swim meets. A roster (with each swimmer’s name) will be posted on the swim team’s bulletin board prior to each meet. Please check yes or no to indicate your attendance at the meet. This allows our coaches to plan each meet more accurately. If you are aware of schedule conflicts, please notify your coach. If your name is not on the list, add it to the bottom. 6. Several special events (Pasta Party, Ice Cream Party, Sleep over, awards, etc.) are planned throughout the swim season. Please be sure to check your email through sign up genius for more information. 7. The Sea Raiders are looking for a few good men/women to volunteer their time to a good cause. For the regular season, we need Snack Bar Assistants, Stroke and Turn Officials, Special Event Coordinator, Computer Manager etc. For more information email rhsearaiders@gmail.com. Please remember every meet your family attends, will require an adult representative to volunteer. Please check the Team Bulletin Board for updates and/or changes.